Only kidding - good on em! Hope some interesting stuff comes out of it. By "interesting" I presume you mean "the location of their future Moon Base"? No, I am not kidding. International agreements notwithstanding, the first country to establish a base on the Moon takes control of the Moon. If it takes 5 missions to deliver the materials necessary to establish such a base then the 6th mission can be used to weaponize it. This is fascinating .. I dont understand it all, so if anyone has a specific interest in counsciousness and numerology please translate and interpret. I gather that one of the findings or implications is that similar neural activity was detected in waking brains as in dreaming brains .. REM sleep .. in fact the suggestion might be that brain activity is higher. Overall, our study adds to a growing body of work - much of which has been led by Carhart-Harris and colleagues - that is now revealing the brain-basis of the psychedelic state. Our data show that a simple measure of neuronal signal diversity places the psychedelic state 'above' the normal waking state, in comparison to the lower diversity found in sleep and anesthesia. Taking this work forward stands to do much more than enhance our understanding of psychedelics. It may help expose how, why - and for whom - psychedelics may help alleviate the appalling suffering of psychiatric disorders like depression. And in the end, it may help us figure out how our normal everyday conscious experiences of the world, and the self, come to be. After all, everything we experience - even when stone cold sober - is just a kind of 'controlled hallucination.' Our perceptions are just the brain's "best guess" of what's going on, reined in by sensory signals. It's far from conclusive, as is often the case with ongoing research. It seems to add further likelihood to enhanced consciousness being a result of LSD use (despite this, I've never wanted to try the stuff and still don't). I wish them success in being able to use their research to treat people suffering from depression. That's about all I can think to say on this, Sky. Not every person is going to understand you and that's okay. They have a right to their opinion and you have every right to ignore it. I wonder how that stuff works when it's between languages with significantly different sentence structure, like German putting the verb at the end. I don't know, but I'd bet it has memory and predictive algorithms that parallel the same way that you, or I, do when we're talking to people and language-switching. [[only faster...if not now, then soon]]. I was only good enough at German to order meals, talk about the weather, and pick up the waitress...[[well, a little better than that...]] but it ain't the structure that's the hard problem. Huh...I don't think I like that if it ends up working. Cuz if they can do that, eventually it will be possible to, for instance, encode a virus in the pattern of a shirt, or put it on your face with your make-up---and infect computers that look at it/take pictures of it. So photo-bombing people's selfies could be much less like photo and much more like bombing, and a new method of terrorism/intelligence gathering/spying...among many other things, by other methods through other sensors. Interesting parallel, one of the things I'm trying to write and I've talked about before has a twist on that as a fundamental underpinning of what the universe is like. Another thing---I know I bring this one up a lot, but the book "Mother of Storms" has a thing going on, kinda the reverse---the web is secured and constantly updated by basically "good viruses" [that also exchange info with each other, so are also self-improving]---and, cuz people are plugged in, these critters adapt to improve people's brains/functions. Astronomers now think the galaxy is "significantly warped at its edges"
...or put it on your face with your make-up---and infect computers that look at it/take pictures of it. CV Dazzle camouflage just got more interesting. From the link provided by Skyweir: "It took him a year and a half of research to find an effective method to extract a molecular compound from the avocado pit and obtain a biopolymer, which could then be molded into any desirable shape. Munguia's avocado-based bioplastic was born. The bioplastic products manufactured using his process biodegrade after 240 days of being exposed to the elements or buried in the ground, while their fossil fuel-based counterparts can take more than 100 years." No perfect with that "over 100 years" part for soe of the material, but a vast improvement over conventional plastic. It gives me hope! I think its brilliant and a great initiative to come out of Mexico. 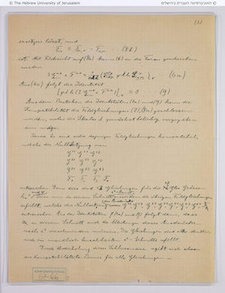 A never-before-seen page of Albert Einstein's handwritten notes and equations on the unified theory of physics has been discovered in an archive of Einstein manuscripts recently acquired by The Hebrew University in Jerusalem. According to a statement from the university, the newfound page was part of an appendix that Einstein included with a scientific article on unified field theory -- the long-sought theory that unites all the fundamental forces of nature into a single set of equations -- which Einstein submitted to the Prussian Academy of Science in 1930. The long-lost note turned up in an archive of 110 manuscript pages that The Hebrew University recently acquired from a private collector in Chapel Hill, North Carolina. Many of the new pages have never been displayed to the public before, including 84 pages of mathematical calculations written from 1944-48, plus a number of letters to Einstein's friends and family. But it sounds a predominantly computational achievement from the perspective that it has no real time impact.